Thank you Rene’. I believe that since God inspired Psalm 119 and it is the longest in the Bible, the very length of it shows the importance to God of His Law. Not that we are saved by it but to meditate on it helps us to be more obedient to it. I appreciate your encouraging remarks my friend so much. Thanks Jack. I don’t believe there is any significance to a screen glowing white. I believe it was just a glitch. Jesus does not manifest Himself in a website or in a monitor. Does your computer have a “Clean Disk” and “Defragement” tool in it? Yes, I have heard about the gotquestions.org. I didn’t know it has so many answers. One thing about that website is that sometimes their answers to questions about the Bible, God, and Jesus are not completely accurate for the Bible, the Word of God, is knowledge that must be associated with the work and the Person of the Holy Spirit. Does that make sense friend? Thank you Jean-Marc for your encouraging comment. I have tried to use mediation to memorize important key verses, among my favorites are 1 John 1:9, John 10:28-29, John 6:37, 2 Cor 5:21 for these are very helpful in sharing the gospel with the lost. Does that make sense? Thank you so much Jean-Marc. Meditating on His Word does make me want to worship too…and the shortest verse in the Bible, “Jesus wept.” is probably what is breaking your heart too. Oh that others would know the Father and come to Jesus for eternal life. That is like what breaks the heart of God breaks yours…and that’s a good thing brother. I always had a problem with meditation, i believe this is the solution. Thank you very much pastor jack. Thank you Nelson. I still have a problem with meditating on the Word of God because of the many demands of the world and the business and noise of life. I appreciate your kind words sir. we as christian people of god .we must meditation on god words day and night.it should be a daily thing read god word ,study god word the bible is god word.let the words of god lead you in all things the bible is the true. meditation on the word of god everyday . i have learned a lot from your explanation because all this while i have read bible without pondering it.thank u very much. Thank you for your kind words. Even though I wrote this, I need to take it to heart for I do not, clearly, meditate enough on the Word of God. Thank you Emmanuel for your encouraging remarks. Thank you so much for your very kind words. I need to do better in this area as I neglect it too often. Please accept my thanks for your words of encouragement my friend. I’ve heard that to meditate also means to speak the word. I think that’s what it means in Hebrew. So speaking out or uttering The Word would also be meditating on it. Hello Sharon. Brilliant observation and its spot on. Good insight. I agree. Thanks for adding so much to this article. I loved your comment. Thanks Jack for this wonderful and timely article. I promise to exercise on the scriptures you quoted in this article with a view to having fulfilling walk with the Lord. I Particularly like the distinction you gave between true meditation on scriptures and what occult organizations put forward as meditation. May God bless you richly sir and increase your anointing and make your walk with Him more rewarding. Thank you so much Ifeanyi for your kind words. It is something that I must discipline my self at also. Thank you for the encouraging words my friend. Thank you so much Deborah for your question. Yes, you must be in the Word and I think should be reading it daily. Take one verse each day that really stands out to you and write it down on a piece of paper, a sticky note or a 3 by 5 card and meditate on that one verse. That way you can not only meditate on it, you might even memorize it. Start with 2 Cor 5:21 since that is a great verse summarizing the gospel. You read about people feeling the presence of God but feeling is not trustworthy. It is not what we feel more than what we know God says. You are not going wrong….I think those people who rely on feelings are putting too much trust in their feelings and not in the truth of what God’s Word, the Bible, says. I suggest you but a good study Bible like the Reformation Study Bible (English Standard Version) or the MacArthur Study Bible (English Standard Version). This should help a lot. Hello Sir, i was a christian before, but i lost touch with Christ, and my friend recently brought me back to Him by inviting me to one of her church events! Hallelujah i’m so glad to have gotten in touch with my Daddy God again. As a “new christian”, i’m trying to begin reading the bible, and i’ve googled around and i found out that it would be easier to begin reading from Mark, which i’ve done. However, i’m not totally clear of all the terminologies and things, so what would you recommend for a good start? Also, how do i pick verses to meditate on? Do i just randomly pick any verse and just begin meditating on it? How do i do it? Is it through reading, really getting deep into it, understanding it, and memorising it? Lastly, i’ve been praying every night, but i’m not sure if i’m doing it right, i just talk to God like i would with my friends, but i never got an actual response like my friends would. How do i get an obvious response? How do i really communicate with God one on one and really sense Him there? I appreciate you taking your time off to reply to this. Thank you so much, i hope you’ll have a great day! God bless you. Thank you Gigi for your questions and comment. I am glad you are back in the sheepfold of Christ. 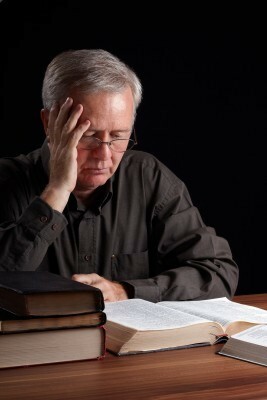 As for reading the Bible, let me suggest this article which gives you a good plan for reading the Bible for new believers and beginners at: http://www.whatchristianswanttoknow.com/where-is-the-best-place-to-start-reading-the-bible-for-a-new-christian/ I also strongly suggest you buy a Study Bible which gives footnotes that explain some of the more difficult Scriptures. The MacArthur ESV Study Bible is most excellent for this purpose. Also, how do pick verses to meditate on, I would pick Bible verses that are very meaningful and powerful like 2 Cor 5:21, 1 John 1:9, John 6:37, 39, John 10:28-29, Romans10:9-13. These verses have amazing meaning about God. You can write one down per week on a 3 by 5 card and bring it with you everywhere. Meditate on one verse a week and you’ll end up memorizing it and in a year, you’ll have memorized 52 verses! •	for those who despitefully use us (Luke 6:28). This article brought back memories of living in legalism. Are we suppose to focus on the “law of sin and death” or “Through Christ Jesus the Law of the Spirit of life that sets me free from the law of sin and death.” Romans 8:1-2. We need to know what the law says. Paul tells us that the law is good in that it tells us what sin is and our need for a savior. It points us to Christ. 1 Corinthians 15:56 The sting of death is sin and the power of sin is in the law. v57But thanks be to God! We have victory through Jesus Christ our Lord. We are saved by grace, Ephesians 2:8-9 makes this clear. v10 our works are to be expressions of our love for Jesus. It is not to be rigid, pious or better than everyone else by what we do or don’t do. Hebrews says to fix our eyes on Jesus the author and perfecter of our faith… we will then be involved in acts of service for Jesus towards others. Galatians 6:9-10. What Paul says in Romans 7 is very interesting. If we are in Christ we know what sin is. And our focus will be on his will for us. Hello sir, may God continue to bless you and inspire you more. Thank you for your very kind words Joy. I appreciate the encouragement. Thank Pastor,A word just come in to me now to meditated on the word of God day and night. I got the urge to learned about how to do that, and I find out that I was only reading the bible but cloud not asked myself some question that will help me to reflect just as you gave example above.I pray God give me the grace to hid the word of the Lord in my heart in Jesus name Amen.Thank you pastor. Thank you Nadia…you are so kind. I agree with you on the encouragement found in meditating on the sweet taste of the Word of God. Amen. Thank you for accepting the task given you and taking your responsibility seriously. I commend the men and women who were called by God to teach and preach the Word of God, not only to those who have accepted Jesus as Lord and Savior, but those who are not a part of the Household of Faith searching. I applaud their daily sacrifices from their families to be about the Father’s business. My comment is that I feel that some of us don’t realize who our Creator, Almighty God really is. He always deserves the upper case (G) – God is omnipresent, omniscient, omnipotent. He is not a little god. We cease to exist without Him. It is because of His mercies that we are not consumed because His compassions fail not. They are new every morning, great is His faithfulness. Lee….I so much needed your encouragement. I get so much persecution, believe it or not, from other Christians over some of these articles. Amen our not existing without Him. I thank God for such believers like you who are like Barnabas in the Bible…the encourager. May God richly bless you for that. Thank you so mush for your word. I have been given a desire from the Lord to read the Word all the time and I love it, but I have been having a more difficult time lately. Is this linked, do you think? Thank you Theresa for your comment. I struggle to be in the Word daily but make myself do it…sometimes I crave it but do have times where I struggle. I think this is the enemy trying to keep us from what he knows we need. I find that meditating on His Word is one of the hardest things to do but just the fact that you’re in the Word is a sure sign of the Spirit working in you my sister in Christ. May God richly bless you. Thank you for your comment, I am finding that I am getting opposition – scary thoughts, anxious thoughts etc, especially since I have been in the Word. pastor Wellman thanks for this piece it had really helped me after studying your work. am saving it on my phone to read it everyday. please Pray for me to hear the voice of God. anytime i read Psalms 42:1-2 i feel like speaking to God but doesnt hear him. it seems like forcing myself. Hello my friend. Please know that I will pray for you my friend in Christ. You must not depend on feelings…trust what God says. which is more reliable? Your feelings or God’s Word? Don’t stay in Psalm 42:1-2 but move past that and read all of the chapter because it ends with much more joy than you stopped at in verse 2. we’re not supposed to read Scripture like that but read the whole context to grasp the whole meaning or you’re taking a text out of context and making it be a stand-alone pretext. The Bible’s not meant to be read that way my friend. Don’t put too much weight on feelings. read John chapters 6, 10 and 11. Especially verse 11 of Psalm 42. Did that help my friend. Praying for you. so you can help me .if you can give me an email so you can assist. Hello, I’ve been reading Scripture every morning. Mostly psalms 4,5, 6, 34, 40 and 91. After Google what the word Selah meant at the end of many verses in psalms, it lead me to the many questions and responses that you gave to many. I have been praying that God gives me wisdom to understand His Word as my reading comprehension level is very low even though I graduated high school and have some college. I know and believe that I did not stumble upon your site or this information accidentally. I believe that God led Mr here for help in what I need to do to help me with meditation and understanding His Word. I’m Catholic and at one point we did not read the Bible. We listened to the priest because back in the day, it was feared that Scripture would be misinterpreted; however, a lot of things have changed in the Catholic teachings and we are encouraged to read our Bible as well as study and meditate. The Catholic Bible have other books thats not in the Protestant Bible like Sirach and Baruch, to name a few and I love reading Scripture from the additional chapters too. I love all the advice and encouragement that you’ve given in your responses. I’ll definitely use this information in helping me continue in my Faith and journey as one of our Lord and Savior disciples. Thank you!